On my recent trip to Stirling for the British Shakespeare Association conference I made a point of visiting the city’s historic castle. Although I knew of its importance at a strategic spot overlooking the crossing of the River Forth, I was unaware of its history and in particular its Shakespeare connections. I didn’t realise, for instance, that this castle was lived in by so many Scottish monarchs. Much of the castle has been gorgeously restored following years of neglect, and is now decorated as it might have been around the time of James V’s death in 1542. 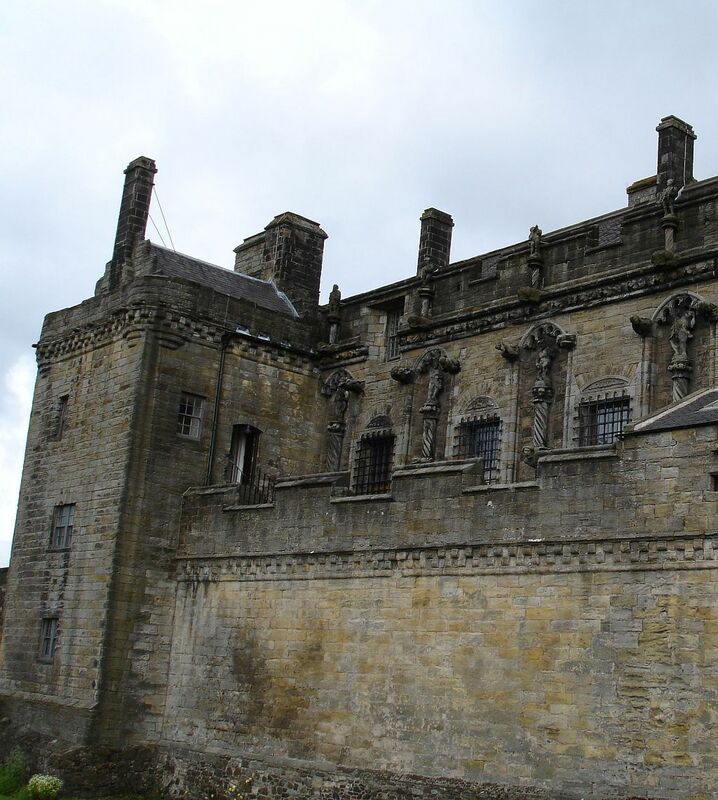 In 1538 he began to turn Stirling Castle into a glorious Renaissance palace like those he had seen in Europe. He was the father of Mary Queen of Scots, the mother of the Scottish king best known to Shakespeareans, King James VI, who became James 1 of England in 1603. Shakespeare and his company became the King’s Men, and many of his plays are known to have been performed before him. The castle had always contained a chapel, but, as it became clear that Elizabeth would bear no children, James VI was her most obvious successor. When his son was born, the old Chapel Royal was demolished and rebuilt in only six months in order to provide a chapel fit for the baptism. This child was christened Henry (a reference to the English kings of that name). The chapel was lavishly decorated with pictures, tapestries, sculptures and a golden ceiling, with the font occupying the centre of the space. The baby was carried into the chapel through the new triumphal arch by the English Ambassador, and the event was so significant that James had an account of the baptism published in both London and Edinburgh. From his birth, then, Henry was seen as the heir to the throne of England, so his death at the age of 18 must have been truly devastating. Unfortunately little remained to show what the gorgeous ceiling might have been light, but the decorative frieze in the chapel has been painstakingly restored to its appearance when it was first added for the expected coronation visit of Charles 1. The frieze was painted in 1628-9, but Charles’s visit did not occur until 1633. The internal decoration of the castle has been restored to something like its appearance during the reign of James V. As well as being sumptuously painted, other decorative features are being installed or re-created. An inventory of 1539 records that the castle contained two sets of tapestries telling the story of the mythical Unicorn. In an extraordinary project, a set of sixteenth-century Unicorn tapestries now in New York are being copied using traditional techniques. It’s a great privilege to see the painstaking and skilful work of the weavers in a special workshop. Each tapestry takes between two and four years to complete: several are already in place and the final one will be finished by the end of this year. 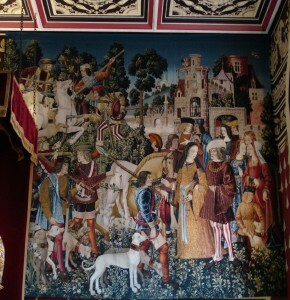 Their detail and brilliant colours remind you of why these tapestries were so hugely expensive to produce. 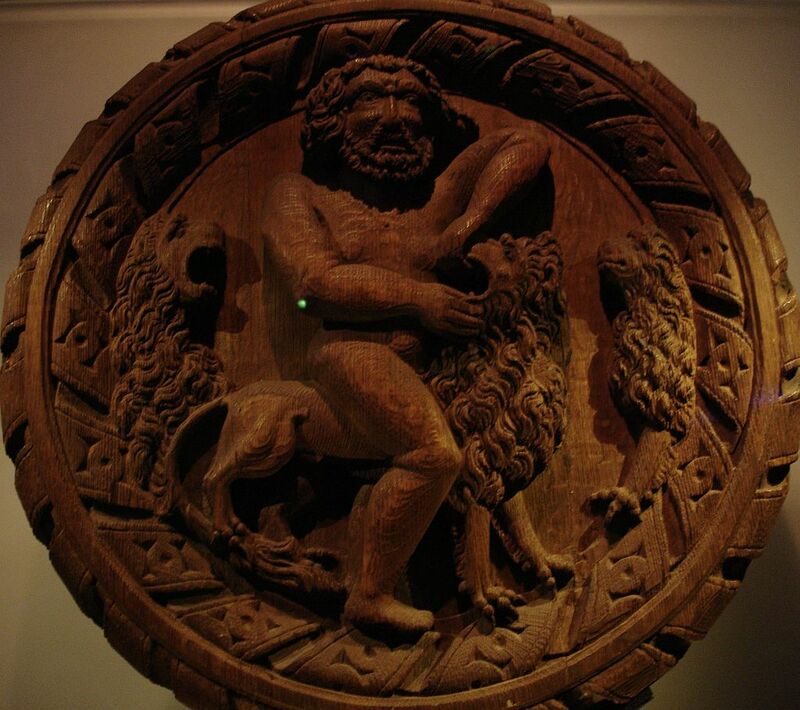 The other special internal features are the Stirling heads, carved wooden bosses, brightly painted, that cover the ceiling of the King’s Inner Hall. The ones in situ are all modern copies, but in a special exhibition many of the originals are beautifully displayed. There’s a real variety of subjects from portraits of known members of the court, through representations of the Nine Worthies (a truncated, comic version of the pageant of the Nine Worthies is staged in Love’s Labour’s Lost, showing what a popular subject this was), and several showing Hercules, the ultimate moral man, with whom James V associated himself. 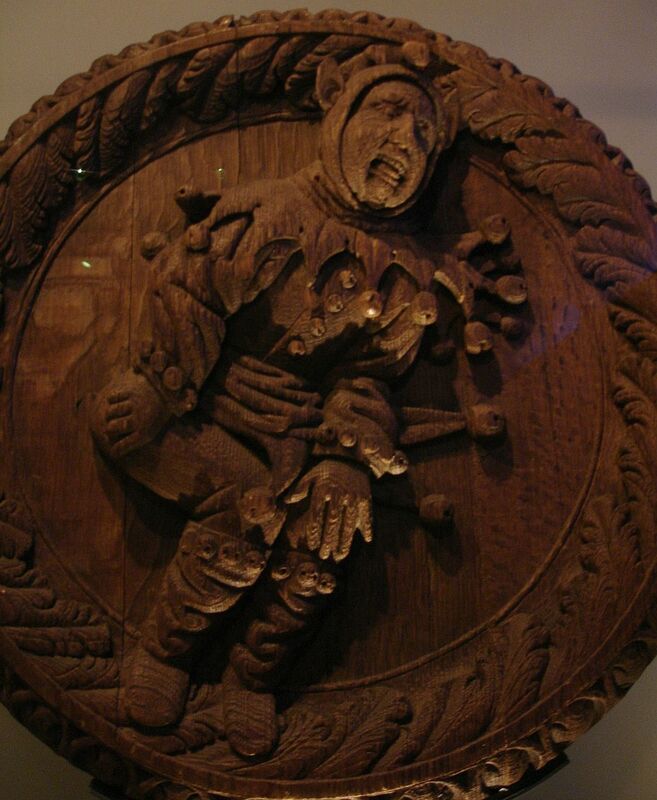 One of the heads represents the court jester, a popular entertainer. 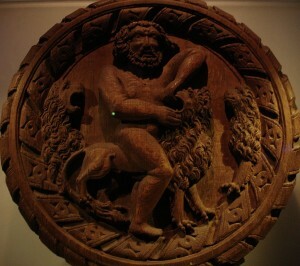 James IV had a jester, as did James V, John Bute, known as ‘gentil John ye Inglise fule’. Archibald Armstrong became James VI’s jester who remained in royal service into the reign of Charles 1. Touchstone in As You Like It and, particularly, the fool in King Lear are outspoken court fools who have an influence in Shakespeare’s plays. It’s not spectacular like the state rooms or the Great Hall, but the Prince’s Tower is an important part of the Castle. It was built around 1500 and was traditionally the nursery of Scotland’s monarchs. From the time of James 1 of Scotland onwards, royal children were raised in the safety of Stirling Castle and seven successive monarchs began their reigns as children. 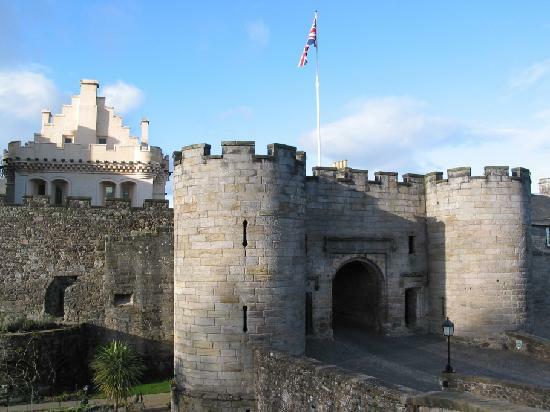 The Prince’s Tower is where James VI was taught by the Protestant scholar George Buchanan, and Henry, his son, also received his education here before his father was declared king of England. James left the castle, and Scotland, in 1603, returning only once, in 1617. It’s said that he found he could rule Scotland from London, so found no need to go back to his native country. This entry was posted in Shakespeare's World and tagged British Shakespeare Association, James 1, Scotland, Stirling Castle, Stirling Heads, tapestry. Bookmark the permalink.